What You Need to Know About ants in Your House – Pesterminate Inc.
You may be able to exterminate these pests without calling in a professional, though more severe infestations will require a stronger approach. Some ant species, like carpenter ants, can cause structural damage to your house if not treated immediately. Other infestations might be harder to eliminate due to a colony resisting natural and chemical extermination solutions. Take note of where you’re seeing the ants. They may run along your baseboards, emerge from holes under cabinets, or pop out of cracks in your walls or floors, particularly if your house is older. There may be other exterior entry points to your home, including visible ant colonies in your front or back yard or cracks in your driveway. Sugar ants—These ants typically feed on sweet or greasy foods and can be found around your kitchen or places where you store food. They distribute food and water to the rest of their colony. They have brownish-black bodies with black heads and their nests are typically found in old wood or dark, moist areas. Carpenter ants—Carpenter ants are either black or red and typically 3/16 inch to ½ inch long and prefer to build colonies in moist wood, such as tree stumps, around bathtubs, showers,or dishwashers, or behind bathroom tiles. They are most easily identified by their thorax, which is rounded and smooth. Carpenter ants will tunnel in wood, creating smooth channels and leaving behind wood shavings, so if you notice wood shavings concentrated in a specific location, the colony may be close by. If you do investigate and find tunnels that are dirty and filled with material, the culprit may be termites. Pavement ants—These ants are also black or reddish brown with pale legs and antennae and are typically ⅛ inch long. Pavement ants prefer to nest in soil covered by solid material like rocks or pavement and are often found under driveways, sidewalk slabs, or concrete foundations of houses. Pavement ants are most likely to enter your home through cracks in the wall. Moisture ants (yellow ants)—These ants are longer and yellow or reddish brown in color. When they are crushed, they give off a citronella scent. Moisture ants tend to build their colonies against the foundation of homes or outdoors under rocks and logs. As their name suggests, they are attracted to high-moisture areas and are often found in bathrooms. When you locate the colony—the source of your ant infestation—the next step is to eliminate any pheromone trails made by the ants. Pheromone trails are basic scent trails that ants leave behind for other ants to join them in finding food and water. When you identify the source of the ants, you can eliminate the entire ant colony by getting rid of the existing trail. Here’s how. Keep your house clean—By putting food away, cleaning off countertops and floors, and emptying the trash daily, you reduce the risk of ants in your home. Try to regularly vacuum, mop, and wipe down counters, especially in areas of your house where you prepare or store food. Be vigilant during the hotter months—Ants are more prevalent in warm and humid conditions than they are in colder temperatures. They tend to appear more often during the summer months than they do in the winter months. Especially during warmer periods, keep your house clean. Find possible entry points and seal them off—Spray natural pesticides along the perimeter of your home to prevent ants from coming inside. Fix leaks in your house—Ants are attracted to food and water sources. By fixing leaky pipes and cleaning up damp areas around your house, you will lessen the chance of allowing ants to find a source of water for the whole colony. 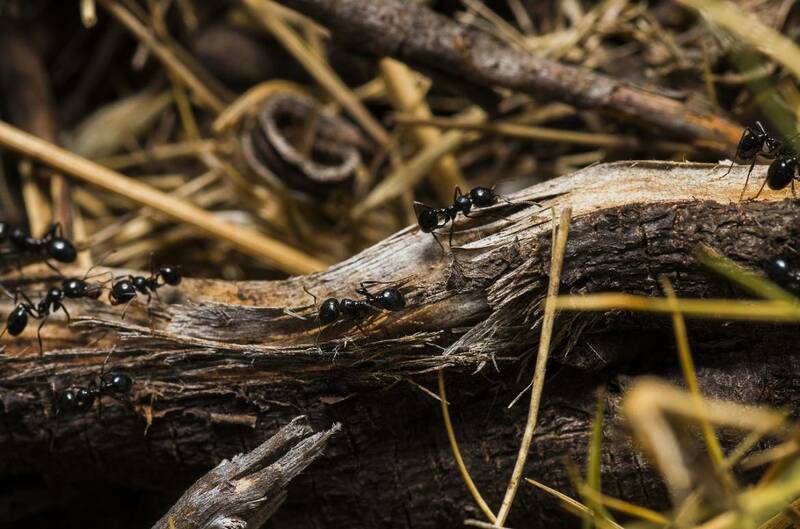 Kill ants in the yard—If you see nests outdoors, spot-treat the area with an insecticide. Spray in the morning and late afternoon when ants are most active. Insecticides that contain bifenthrin work especially well in dismantling ant mounds and getting rid of most ants. Call in a professional exterminator—Some colonies are extremely hard to eliminate despite your best effort. In this case, call in a professional to get the job done. Exterminators have tougher chemicals to get rid of the ants and can save you the time from checking every crack and crevice for ants.